A trio of exquisite yellow blooms. 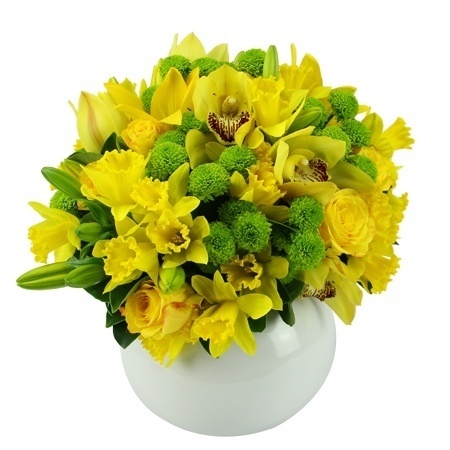 This new arrangement combines yellow Daffodils, yellow Roses, and yellow Cymbidium Orchids and is delightfully set off with green Chrysanthemum Poms. Flowers for Everyone buy flowers from local growers to carefully craft this arrangement designed just for Daffodil Day. Because only the freshest longest lasting flowers are delivered, freshness is guaranteed each and every time. Order securely online, or call 1800 66 6 46 today to talk to a member of our friendly customer service team.